Obsessed with overwater bungalows? Make room for the new kid on the block: the underwater bungalow! Conrad Maldives Rangali Island is slated to open its first underwater bungalow in November 2018. 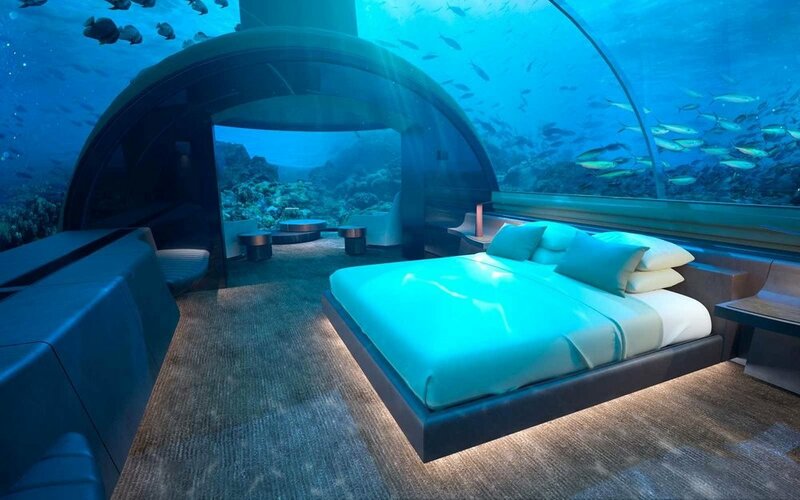 Dubbed The Muraka, which means coral in the Maldivian language of Dhivehi, the underwater residence will allow guests to sleep with the fishes (in the fun, far less morbid way!) The two-level structure, which can accommodate up to nine guests, will include undersea sleeping, living, and bathing areas, while the overwater portion will include a second living area, two additional bedrooms, a bath and a half, a butler suite, and a gym. A stay at Muraka will cost you a cool $50k a night but you'll have a team of four dedicated butlers providing around-the-clock service and everything — and we mean everything — is included in the spendy price. You'll also be upgraded to Hilton Honors Diamond status and receive a 90-minute spa treatment each day. The resort is already home to Ithaa, an underwater restaurant, an award-winning overwater spa and classic overwater bungalows. The addition of Muraka makes the Conrad the hottest overwater bungalow resort in the Maldives!